Objectives: Focus AF ISR on winning today, while preparing for tomorrow. The RTF shall pursue research to discover new and innovative ways to increase operational agility and more fully realize multi-domain integration. 1) Revitalizing integration of ISR at the Squadron Level – Air, Space, and Cyber. 2) Developing ISR Airmen to lead joint operations, to include evolving composition and training of ISR organizations to deploy as a JTF HQ. 3) Reaching Next Generation ISR Dominance through exploitation of Publically Available Information. 5) Transforming the ISR Enterprise to perform automation, machine learning, and deep learning. Description: As one of the Air Force’s five enduring core missions, ISR is integral to Global Vigilance and foundational to Global Reach and Global Power. With the continuing challenges of the 21st Century, it is imperative senior leaders fully leverage the vast array of national capabilities along with those of the Total Force, our sister Services, the Intelligence Community (IC) and our international partners. Thesis and scope: The course focuses on USAF and joint ISR capabilities at the operational-strategic level by critically examining “what to expect,” and “what not to expect,” from intelligence. Against this backdrop, the course enhances future leader abilities to critically analyze and synthesize ISR capabilities to improve decision making. The course provides guided study and development of research projects that meet the requirements of this research seminar, supports professional development for Air Command and Staff College and assist larger USAF requirements. The final research product is a 3,000+ word research paper. The technological capabilities of Remotely Piloted Aircraft (RPAs) are converging with the state’s needs for emergency response. The National Guard can utilize RPA’s to support Domestic Operations (DOMOPS). RPA’s, although not optimal for all conditions, are valuable assets and can provide enhanced support to operations. Through an understanding of the legal approval process and their operational capabilities and limitations, a state will be prepared to weigh the costs and benefits of RPA support to any operation. States will need to practice the way they operate in an emergency by including RPAs in future exercises, thereby by improving the level of understanding and confidence in these emerging capabilities. Planning and preparation are key to a state’s improved response options. Disasters are not planned, but responses to them are. RPAs warrant consideration for inclusion and response to DOMOPS. The Air Force Future Operating Concept (AFFOC) identified Globally Integrated Intelligence Surveillance and Reconnaissance (GIISR) as one of five core missions in 2035.1 The AFFOC called for “ISR professionals, with deep expertise in information fusion.”2 However, when exploring current intelligence specialties and their respective training and preparation to execute fusion intelligence, rather than moving toward professionals with “deep expertise in fusion intelligence,” intelligence specialties currently receive limited formal training regarding fusion intelligence, leaving the bulk of training and preparation to perform fusion intelligence to field units. This results in intelligence personnel with disparate baseline knowledge and abilities with an unpredictable and unreliable capability. Additionally, there is evidence that rather than creating personnel with “deep expertise,” the Air Force is creating generalists or jacks-of-all-trades. To develop the desired “ISR professionals, with deep expertise in information fusion,” the Air Force should establish a program to purposefully train select personnel who possess experience in intelligence and aptitude for advanced intelligence work in multi-source fusion intelligence, and then staff positions requiring the production of fusion intelligence with this cadre of trained personnel. The unpredictable and complex global strategic environment the United States currently faces has stretched U.S. military forces thin around the world. The 2015 National Military Strategy emphasizes the importance of adapting to the changes in the global strategic environment, by suggesting the United States cannot afford to focus on only one area at the exclusion of others or attempt to be everywhere all at once. The United States must employ its limited resources with agility and flexibility in order to counter trans-regional threats seamlessly. This is especially true for the Air Force’s fleet of U-2, RQ-4, RC-135, and E-8 intelligence, surveillance, and reconnaissance (ISR) aircraft it refers to as Low Density/High Demand (LD/HD). Current worldwide demand for LD/HD ISR outstrips available supply and spreads assets too thinly across Combatant Commander (CCDR) Areas of Responsibility. With worldwide threats regularly crossing Combatant Command boundaries, the process for managing operational control (OPCON) for Air Force, LD/HD ISR needs modification. 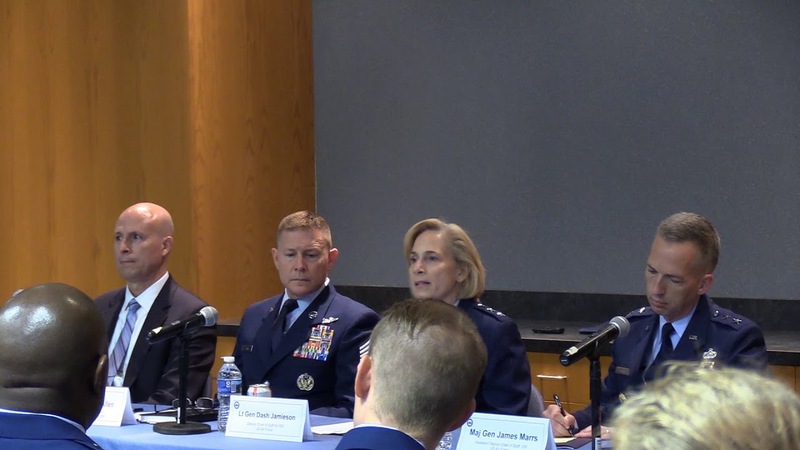 The Air Force needs an OPCON arrangement giving it the authorities to actively manage assets and arbitrate disagreements between CCDRs for ISR collection priorities worldwide. In 2014, the CJCS published the DOD’s ISR Joint Force 2020 White Paper detailing his vision for how the Joint Force will shape, grow, and integrate ISR capabilities to remain effective in future operations. Of the eight initiatives identified, he emphasized that the most important was the development of a joint PED architecture that will replace the multitude of currently-fielded, expensive, and inefficient service-unique, platform-centric PED architectures. The draft FY17 NDAA highlights the transregional, multi-domain, and multi-functional reality of current operations.1 Congress proposed to modify sections of the Goldwater-Nichols Act to facilitate transfer of forces among combatant commands. This bold move by the military’s civilian leadership highlights their commitment to facilitate flexibility in transregional operations and should act as a charge to the military to provide similarly novel, flexible solutions. Strategic C2ISR platforms including the U-2, RQ-4, RC-135, and E-8 are inherently agile with their ability to traverse multiple geographic locations in a short time. This paper proposes to answer the military’s civilian leadership call to maximize flexibility by rethinking the assignment of operational control (OPCON) of those agile, strategically significant platforms. The alignment of limited ISR resources against GCCs’ highest-priority requirements is a complex problem, and current processes are not ideally suited to manage operations of allocated capabilities nor do they offer essential responsiveness to the demands of a complex and dynamic battlespace. To resolve these disconnects, this research examines the current methods of assessing airborne ISR operations and feedback mechanisms, and recommends a taxonomy of ISR roles to inform a mission-centric employment model. This strategy-to-task model links the ISR Role to a given operational context and provides a structure for assessment based on accomplishing tasks, creating effects, or achieving Commander’s objectives. Effective ISR assessment compares projected outcomes with operational events to determine mission effectiveness and provide operational feedback. This assessment and feedback should inform resourcing decisions and guide future employment of ISR assets. In a contested war, the joint force will need to identify, nominate, and strike a greater number of targets in a shorter amount of time than currently required. These conditions will stress the current command and control of a dynamic targeting process characterized by lengthy target development timelines that allow for high-confidence, centralized decision making. The traditional Air Force solution to this problem is to increase the targeting manpower and scope of responsibility at the AOC. However, the AOC will not likely achieve the desired level of “fullspectrum awareness” against a massed enemy at the speed required to support centralized decision making. Additionally, centralized decision making tends to increase decision time but also decreases risk. This essay proposes an alternate course of action that relies less on increased manpower and improved information technologies such as big data analytics, and more on decentralizing authorities to multiple, distributed entities. To shorten the dynamic targeting kill chain in a contested war, the Air Force should accept risk and adopt a flexible command and control concept that decentralizes target engagement authority by placing target identification, nomination, and strike tasking functions as close to the source of intelligence as possible. According to the Joint Operational Access Concept (JOAC) published by the United States Department of Defense in 2012, “Events of recent decades have demonstrated the decisive results U.S. joint forces can achieve when allowed to flow combat power into an operational area unimpeded...and U.S. operational access during that period was essentially unopposed.” However, the next time the nation calls for US military intervention, the operational environment may not be so permissive. Many potential adversaries are developing technologies and tactics to prevent such permissive environments. Cyber protection of weapon systems is necessary in order to avoid introducing unnecessary risk to multidomain command and control, a capability that will be critical in a battle against a peer competitor. Many systems are interconnected and a risk to one system is a risk to all systems participating in the network. The interconnectedness of weapon systems rely on cyberspace and this domain is capable of affecting the physical domain. The Air Force should use a three-pronged cyber defense initiative consisting of aircrew and intelligence operator training, improved Mission Defense Team (MDT) integration, and system hardware and/or software upgrades to ensure cyber domain protection for C2ISR assets. Doing so will help increase the resilience of our weapon systems and allow them to be safely interconnected to achieve the benefits of multidomain command and control. The impending wave of artificial intelligence (AI) will soon permeate every aspect of modern warfare, and its impact will be particularly sweeping in the field of intelligence. With regard to processing, exploitation, and dissemination (PED) of intelligence data, the central claim is that these technologies will take over routine, codifiable tasks that currently dominate the majority of an intelligence analyst’s time. As AI assumes these responsibilities, the analyst gains time to focus on uniquely human aptitudes requiring cognition and interdisciplinary problem solving. Preparing human analysts for human-machine teaming demands a fundamental re-evaluation of how these analysts are educated and trained, shifting the prevailing paradigm from “what to think” to “how to think.” Moreover, it requires the deliberate dismantling of the historically rigid governing structures of the DCGS, as well as purposeful movement toward a comprehensive culture change that inculcates an “analyst first” mindset within every intelligence Airman. The US Air Force’s heavy reliance on space capabilities makes it vulnerable to potentially crippling asymmetric multi-domain attacks in the near future. While Air Force leaders have identified the importance of maintaining dominance in the space domain, their goal of attaining resilient and survivable systems in the future is not immediately attainable. Peer competitors and potential adversaries already possess several operational and developmental capabilities, which place critical US space assets on the losing side of a cost-exchange battle. An option to mitigate many of these risks exists in an airborne mobile-mesh network hosted initially by the Air Force’s high-altitude ISR platforms. Distributed teams are a foundational element for today’s Air Force Intelligence Surveillance, and Reconnaissance (ISR) missions, and global operations in support of combatant commands and coalition commanders are executed regularly by geographically separated teams. In the 25th Air Force more than 29,000 total force Airmen serve at 75 locations around the globe executing ISR missions for the joint force. Lt Gen David Deptula, former Air Force Deputy Chief of Staff for ISR, described this environment as a “rapidly evolving paradigm, called distributed ISR operations, links platforms and sensors, forces forward, and human ISR warfighting experience around the globe in ways that make networked combat operations routine.” Leading in a globally distributed teams environment can prove extremely challenging for myriad reasons and this environment – geographically separated and highly interdependent teams – calls for leadership theory and practice that match this paradigm.